Home / IPL / IPL 12 / IPL 2019 / IPL 2019 Match Preview / Jaipur / Kings XI Punjab / KXIP / Match Prediction / Rajasthan Royals / RR / Sawai Mansingh Stadium / IPL 2019 Match 4 RR vs KXIP Match Prediction, Preview and Head to Head: Who Will Win? 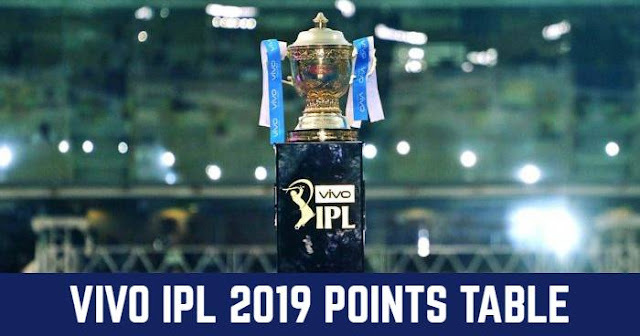 IPL 2019 Match 4 RR vs KXIP Match Prediction, Preview and Head to Head: Who Will Win? 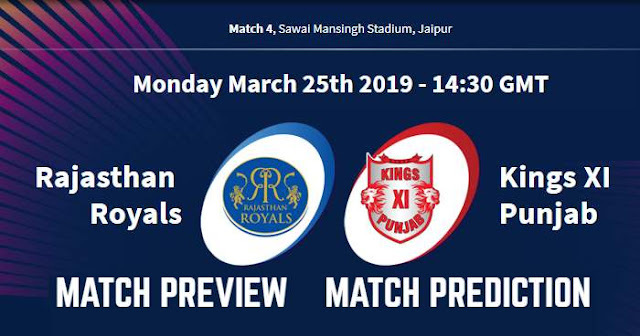 Rajasthan Royals (RR) will take on Kings XI Punjab in the 4th game of the 12th season of Indian Premier League – IPL 2019 on 25 March 2019 at Sawai Mansingh Stadium, Jaipur. As far as weather is concerned, it will be a pleasant day for cricket; the temperature will be below 30 with a light wind. It looks like a beautiful surface. If you look closely under the tinge of grass it is a little bit dry but it is rock hard. So it will not have any impact for the spin. The ball will come on to the bat nicely and it is a fantastic strip for batting. In the last season, Rajasthan Royals managed to finish in the top four but was inconsistent with 7 wins and 7 loses. However, Kings XI Punjab finished at 7th position in last season with 6 wins in 14 matches. One of the biggest advantages for the team will be the return of Steven Smith, who missed all of last season in the aftermath of the Sandpapergate and by the acquisitions of Jonny Bairstow and Martin Guptill. Kings XI Punjab are winning despite some flaws in the middle order but would like to continue with the same playing XI which played against Rajasthan Royals in the last match. Kings XI Punjab have undergone a sea change from last season. Kings XI Punjab retained only 9 players from last season and have 13 new players in a 23-man squad. And also Mike Hesson has replaced Brad Hodge as coach. David Miller will be absent for the match due to an international commitment. In last 5 matches between Kings XI Punjab and Rajasthan, Kings XI Punjab have won 3 matches and Rajasthan Royals have won 2 matches. But Rajasthan Royal are undefeated by Kings XI Punjab at their home Sawai Mansingh Stadium, Jaipur. In Jaipur, Rajasthan Royals and Kings XI Punjab have played 5 matches and all the 5 matches are won by Rajasthan Royals. At Sawai Mansingh Stadium chasing is much easier under the lights despite the pitch not being batting friendly. Our Prediction for IPL 2019 Match 4 RR vs KXIP Who will Win? Rajasthan Royals looks more of a settled team; the team has been tried and tested as a combination. On the other hand, Kings XI Punjab will be playing with a new combination and absence of David Miller will be a place to be filled. and also Rajasthan Royals have a good record at home an extraordinary record against Kings XI Punjab at home. In our prediction, the Rajasthan Royals have more chance to win the match. Toss: Rajasthan Royals won the toss and elected to bowl first. Playing XI for RR: Ajinkya Rahane(c), Jos Buttler(w), Steven Smith, Ben Stokes, Sanju Samson, Krishnappa Gowtham, Rahul Tripathi, Shreyas Gopal, Jofra Archer, Jaydev Unadkat, Dhawal Kulkarni. Playing XI for KXIP: Ravichandran Ashwin (c), Chris Gayle, Lokesh Rahul(w), Mayank Agarwal, Sarfaraz Khan, Nicholas Pooran, Mandeep Singh, Sam Curran, Mohammed Shami, Mujeeb Ur Rahman, Ankit Rajpoot. RR Squad: Ajinkya Rahane, Steve Smith, Sanju Samson (wk), Ben Stokes, Shubham Ranjane, Ashton Turner, Stuart Binny, Shreyas Gopal, Sudhesan Midhun, Jayadev Unadkat, Ish Sodi, Prashant Chopra, Mahipal Lomror, Oshane Thomas, Aryaman Birla, Riyan Parag, Dhawal Kulkarni, Jofra Archer, Krishnappa Gowtham, Liam Livingstone, Varun Aaron, Jos Buttler (wk), Shashank Singh, Manan Vohra, Rahul Tripathi. KXIP Squad: Ravichandran Ashwin (c), Agnivesh Ayachi, Harpreet Brar, Moises Henriques, Lokesh Rahul, Nicholas Pooran, Mandeep Singh, Andrew Tye, Chris Gayle, Ankit Rajpoot, Murugan Ashwin, Karun Nair, Varun Chakravarthy, Arshdeep Singh, Sam Curran, David Miller, Sarfaraz Khan, Mujeeb Ur Rahman, Simran Singh, Hardus Viljoen, Mayank Agarwal, Mohammed Shami, Darshan Nalkande.